With advances in modern dentistry, there’s no reason you should be unhappy with the way your teeth look. Psychologists have proven that a beautiful smile enhances your personal appearance and improves your self-confidence. If you don’t like your teeth, cosmetic bonding may be for you! Cosmetic Bonding, often called resin bonding, is when a tooth resin is bonded to your teeth, then sculpted into the proper shape. The resin is a composite resin forms a durable, stain-resistant surface that can be polished to mimic the texture of your natural teeth. In the past, if your tooth was chipped, stained, or cracked, you would probably receive a crown. Today, bonding is a quick and easy solution for many of these problems. 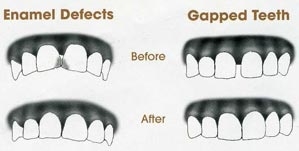 For example, by lightly filing a tooth on one side and building it up on the other, your dentist can eliminate the gap from a gap-toothed grin. By adding thickeners to vary the consistency, dentists can use the resin-like clay to restore chipped or broken teeth or as a putty to fill cavities. In fact, worn or darkened “silver” fillings can be replaced with tooth-colored bonding materials that are indistinguishable from your natural tooth enamel. One type of resin is even used as a sealant to shield back teeth from decay. Bonding is used to whiten stained teeth, to stabilize loose teeth, and to replace missing teeth. With resin bonding you can change the color, the shape, and the position of your teeth, improving your smile. While bonding is a wonderful technique, it will not solve all restorative dental problems. Where a large portion of the tooth surface is damaged, a veneer crown may be the more advisable. What is the procedure for Bonding? Because the tooth surface is left intact, bonding isn’t painful and doesn’t harm the tooth. The procedure is normally completed without local anesthetic or tooth preparation. In most cases, bonding requires only one visit to the dentist. To bond a tooth, the surface of the tooth is etched with a mild acidic solution. This creates micropores (tiny crevices in the enamel), making the too more porous and receptive to the plastic bonding material. Next, the soft, pliable resin is spread over the tooth in layers. A bright beam of light locks the resins onto the tooth surface. Each layer hardens in minutes. After the last coat been applied and hardened, the bonded material is shaped and polished. The resin comes in many shades. Your dentist will match the resin to the shade of your natural teeth. The acrylic materials used in bonding does not last so long as your typical crown. Bonds will eventually chip or become discolored. The bonded plastic coating can break off if you bite down on something hard or accidentally fall and bump your tooth. Bonds last an average of five years. Bonded teeth are also more susceptible to stains than your natural teeth. Smoking cigarettes, drinking tea or coffee, and even eating blueberries may cause some discoloration. In constructing a crown, the combination of materials that provides the most satisfying results is porcelain fused to metal (either gold or non-precious). The metal provides strength, and the porcelain, strength and beauty. The resulting product, a porcelain veneer crown, is giving a lot of people something to smile about. A porcelain veneer crown replaces the enamel of your tooth. First, a metal thimble is custom made to fit over your tooth. A jacket of porcelain is fused or veneered to the thimble. The tooth is prepared so that the complete restoration will rest securely in position, once cemented in place. Because of its strength and resistance to chewing stress, a porcelain veneer crown is functionally superior. The metal thimble provides strength and durability. The dental porcelain, veneered to the thimble, is extremely hard, highly reflective, and color-stable. Porcelain is much less porous than enamel, so the veneers are more stain-resistant. Porcelain provides beauty and strength equaling that your original tooth structure.